A four percent meal tax could soon be implemented in a Northern Virginia county already saddled with a rising real estate tax. The tax, which already exists in Alexandria, Fairfax City and Arlington, would apply to ready-to-eat food and drinks. Board of Supervisors Chairman Sharon Bulova has created a task force to see if people would be willing to pay the extra tax. "I don't think it's going to be a competitive disadvantage," Gerry Hyland, also with the Fairfax County Board of Supervisors said. Because the plan is in its infancy, county officials have yet to decide where the tax would go, but say it could generate approximately $90 million per year. 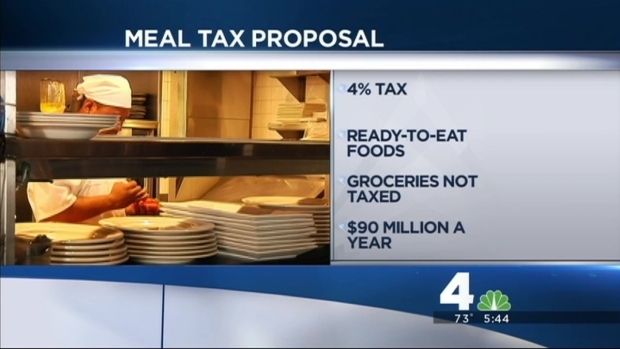 A controversial proposal in Fairfax County would add an extra tax to ready-made foods like those you would buy at a restaurant. News4's Erika Gonzalez reports. Task force recommendations will be presented to the Board of Supervisors in mid-June. Voters would have to approve it during a referendum.